A Lip enhancement treatment is a safe and instant correction to improve the size, shape and symmetry of the lips. For many people, fuller and more sensuous lips come high on their wish list. With botonics Lip enhancement treatment, you can enjoy fuller lips or a soft sensuous look using material naturally found in the body. A simple and quick treatment can add volume and definition, enhance small thin lips, balance our asymmetric lips or reduce the appearance of those fine, vertical lines. 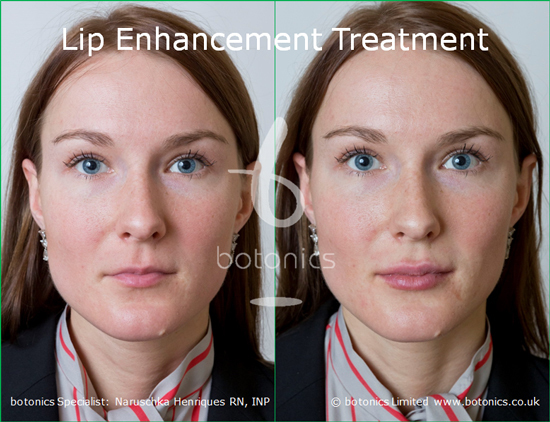 Lip enhancement treatment is available in the UK from botonics at our prestigous Harley Street clinic, in the heart of London’s private medical district. A Lip enhancement needs to be done by an experienced specialist to reduce the risk of asymmetry and to produce an aesthetically beautiful outcome. At botonics, we have developed techniques that produce an instant, graceful, refined and elegant result with minimal discomfort and risks. Volume: Lip augmentation targeting the fleshy part of the upper and lower lip. Definition: Vermilion border or lip outline. Mouth frown: Oral commissures or lines going down from the sides of the mouth – for a younger look sometimes known as the ‘Mona Lisa smile’. Structure: Philtrum ridges that go from the upper lip towards the nose. Smokers lines: Perioral lines or fine vertical lines often due to smoking on the upper lip can be reduced. At your free consultation, the specialist will review your detailed medical history and advise whether a Lip enhancement treatment is appropriate for you. Most people are keen to have their treatment as soon as possible. We are usually able to do the treatment on the same day as your consultation if you wish to proceed, but there is never any obligation to do so. Your specialist will then apply a fast acting topical anaesthetic, and then wait for it to take full effect (about 30 minutes). In addition to the topical anaesthetic, we also normally use a dermal filler than contains an anaesthetic which further reduces discomfort (though it can result in more swelling than non-anaesthetic fillers). The injections only take about 10 – 20 minutes. Lip enhancements tend to last the shortest of all dermal filler treatments since there is most movement in the lips which breaks down the product. Depending on your metabolism, a Lip enhancment treatment will last 3 – 6 months or longer. The filler is gradually broken down over time and safely eliminated through the body’s natural metabolic processes. To learn more, see our Lip Enhancement Frequently Asked Questions. If you want to know what you’ll need to do after your treatment, see our Lip Enhancement Aftercare Instructions. We use only brand-name, gold standard fillers as manufactured and approved for use in the UK. Beware of cut-price treatments that use generic fillers from India or China. At botonics, we take a full hour to administer our Lip enhancement treatments which means the topical anaesthetic we use has time to take effect. Our cosmetic filler treatments are administered by qualified medical specialists who are experienced in the treatment of facial lines and wrinkles. Our price for Lip enhancement treatments start from just £350, and you can spread the cost of any treatment over £600 interest free for up to three months. Who is a candidate for a Lip enhancement treatment? If you’re unhappy with the shape, symmetry or contour of your lips, then our Lip enhancement treatment could be your answer. Click on the Contact us link below to book a free consultation with our Lip enhancement specialist.